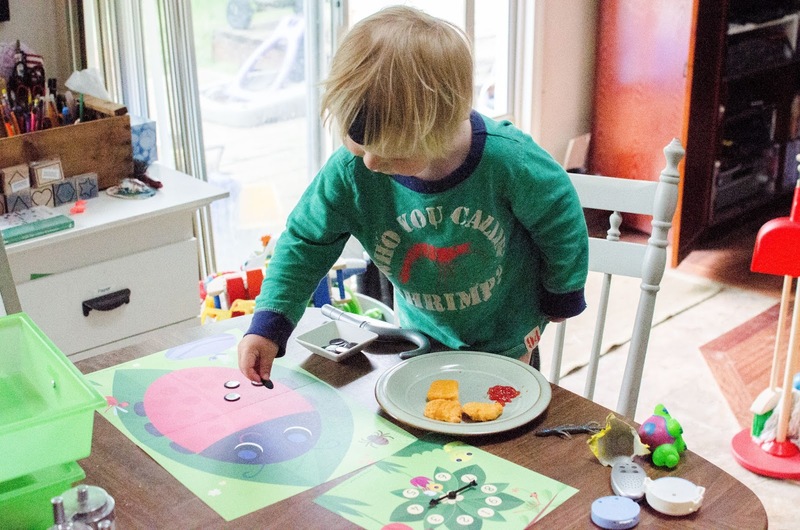 Before Mother Goose Time, I would not have thought of an activity like this. For math and numbers I probably would have just gotten out flash cards and counted out loud with my kids. 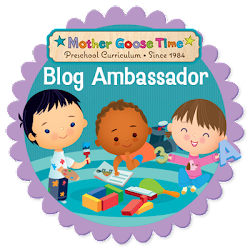 But Mother Goose Time has provided us with all sorts of number and counting activities over the years and this is something you can do easily at home even if you don't have Mother Goose Time. 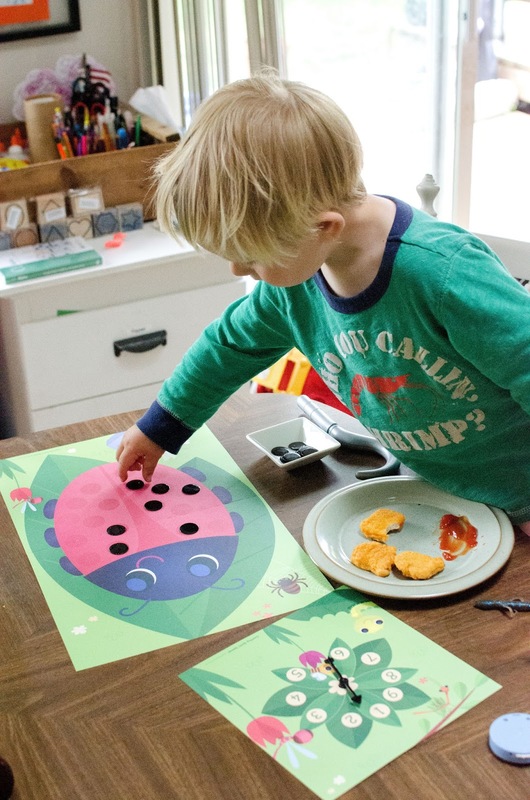 This specific activity went along with the lady bug theme and as always is incredibly adorable. Chris Lensch is the graphic designer behind MGT and I have no problem filling my home with his works of art. 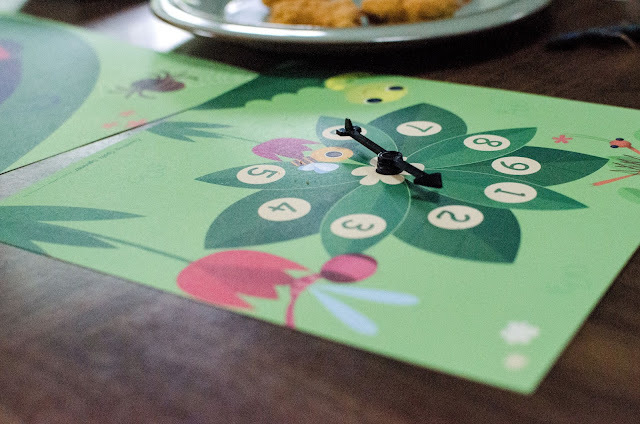 We received a bug spinner with numbers up to 9, which is the number we are focusing on this month. We also got a large lady bug who is missing her black spots and black Bingo chips. As with most of our MGT activities they are done along side either chicken nuggets or cereal. 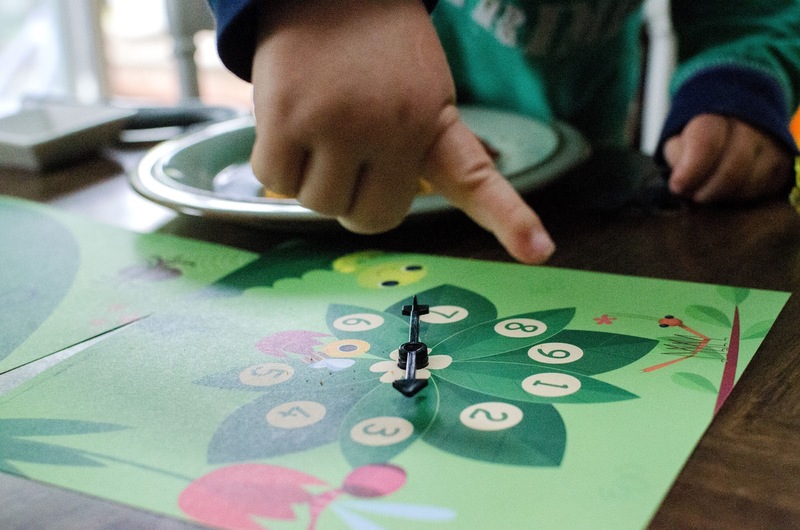 Adam would spin the spinner and then count that many chips and place them on the slightly darker red spots on the ladybug. 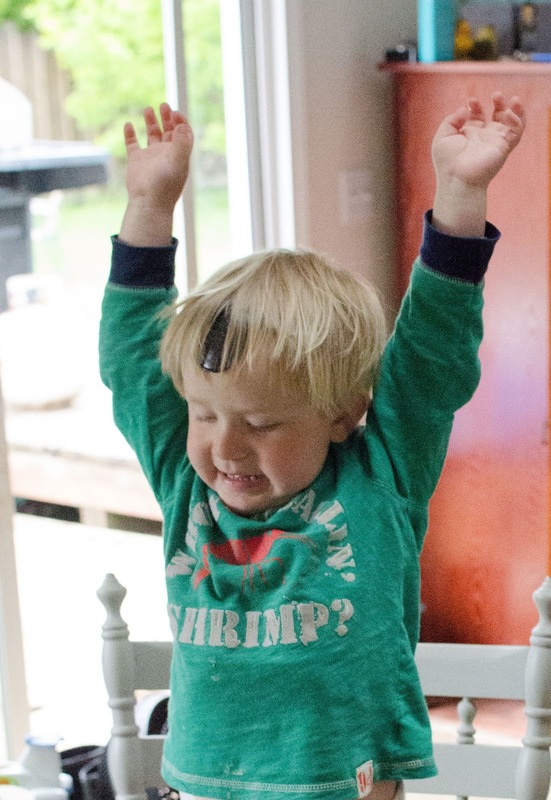 He would celebrate every time he got the right number placed on the ladybug. Not only are we counting but picking up and perfectly placing the chips is of course a great fine motor activity. He would flick the spinner a few times until he got a good spin on it. He can not recognize the written numbers yet, so we would tell him the number and he would start counting. 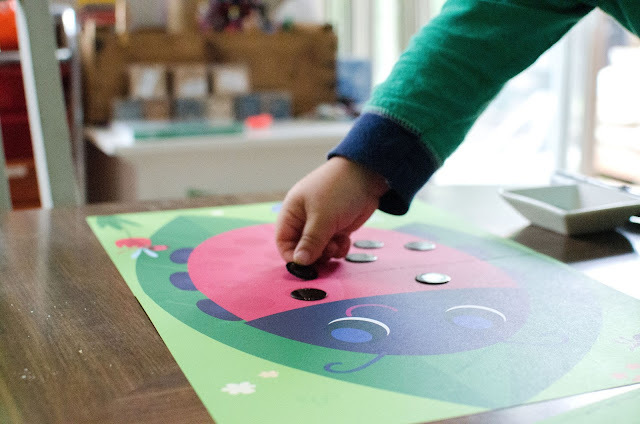 Once he got all the dots on the ladybug we would slide them off and start again. He filled the bug with dots twice before he was ready to move on. That was quite a few spins. Something like this can easily be made more challenging by having the child add the two numbers they spin together and then placing that many dots. 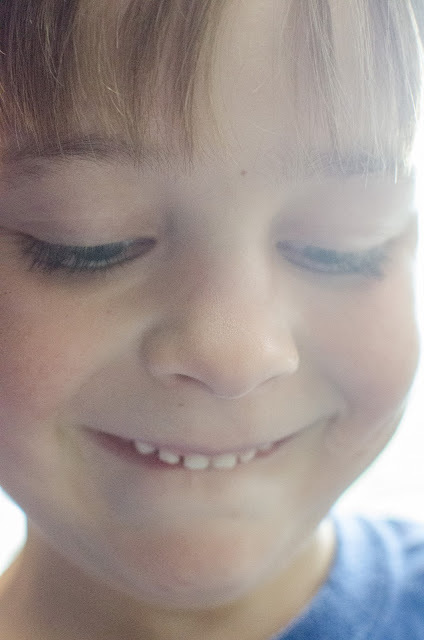 In fact many children will most likely do this in their heads naturally, especially with the smaller numbers. If I already have two on there and add three, that's five! Adam discovered parts to a Disney pirate set he got for Christmas. 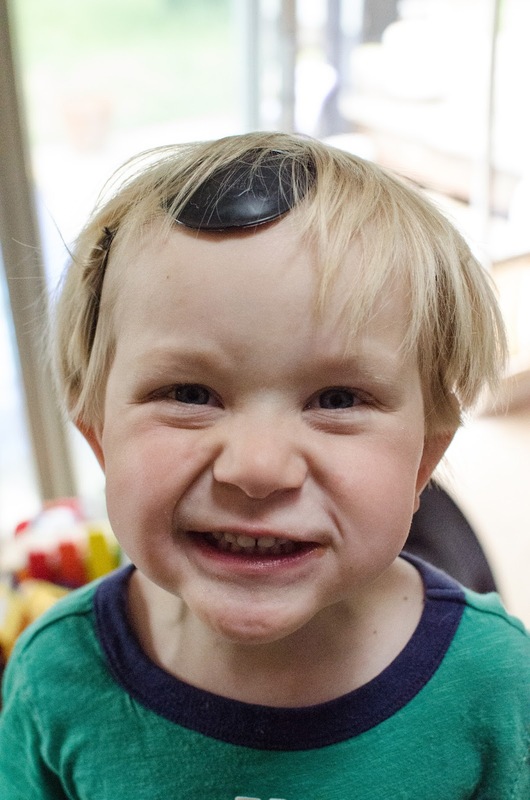 He had the patch over his eye but placed it here so he could see. And my Lachie, trying not to smile when I had the camera in his face. His eye lashes have always been amazing! So if you want to get some counting practice in, first figure out what your child is really into and then create something like this. I did this once for a little friend that was over visiting. The ONLY thing he wanted to do was play with the toy trucks and other construction equipment. So I got out my flash cards with numbers one through five, made paper rocks and asked him to deliver the correct number of paper rocks to each card. It worked! He happily got right to work hauling rocks. So think outside the box and get your kiddos counting. A toddler should be able to verbally count, not necessarily in the correct order. 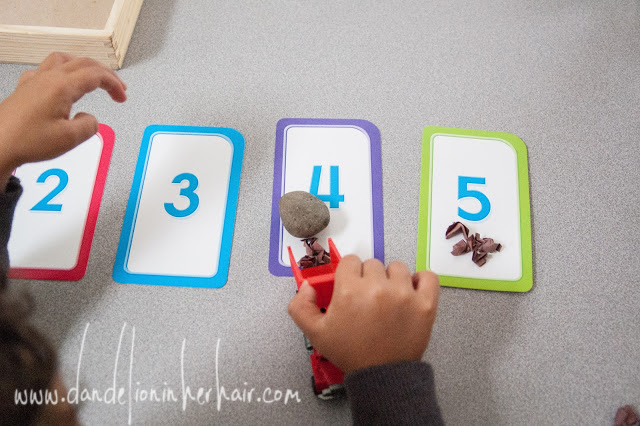 As the toddler starts nearing preschool age they should be able to point to one object at a time while counting. This is the one to one correspondence idea that you may have heard about. When they are firmly in that preschool age, they should be able to count up to 10 objects. The next goal is to get to 20!! Good luck all you parents and educators out there and have fun with it!